Side A written & produced at Negative Studios. Side AA written & produced at Conspiracy Studios. 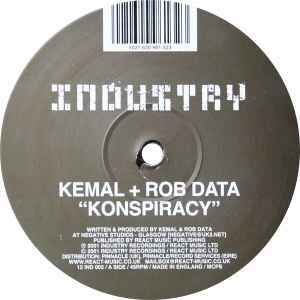 'Konspiracy' is one of my favourite drum & tunes ever and certainly one of the best tracks Kemal & Rob Data [Konflict] produced. 'Konspiracy' starts with uplifting sounds and a crisp break that gets your head moving before the bass has even kicked in! When the tune really gets starting it just grows on you & keeps you interested with some great techy samples. This is a great funky, techy roller which was a firm favourite of Ed rush & Optical upon it's release and is also one of the most criminally overlooked record by fan's of the techier sound of drum & bass.